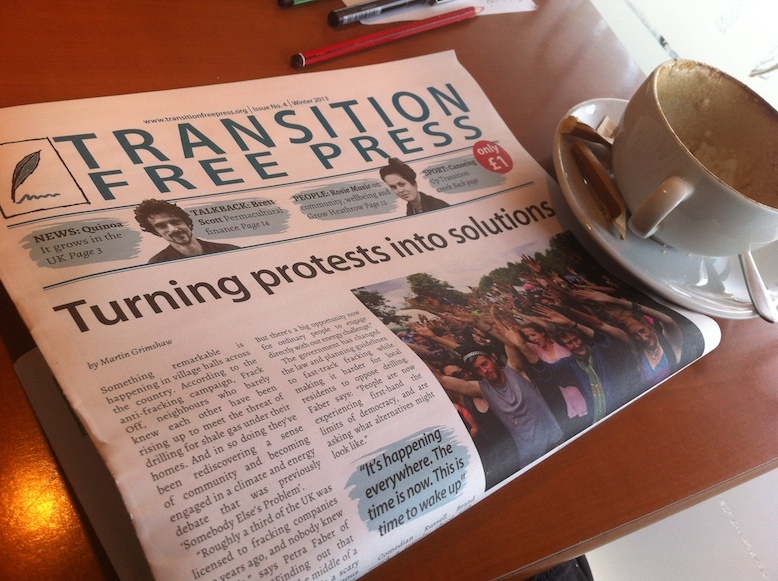 The Winter issue of the Transition Free Press was delivered to Walthamstow today, and is now available at the Hornbeam Cafe for just £1; you can also buy it at this Sunday’s Green Drinks (at the Rose & Crown from 8.30pm on Sunday 1st December). Its an impressive read.. 24 pages packed with a wide range of stories. The front page kicks off with a feature on the growing number of large protest groups over issues such as fracking, climate change, social inequality, corporate tax avoidance, and the banks’ control over money supply. It goes on to explore how many of these are becoming or generating grassroots movements focussed on offering solutions which, instead of material goals, are oriented around common values. how modern finance which aims to extract the highest short term yield using the minimum expenditure is the antithesis of permaculture principles used for sustainable designs which deliver ecological balance (“payday loan companies exploit vulnerable borrowers, thus exhausting the local community and increasing its deprivation”). And there’s so much more – foraging, fermenting, alternatives to fuelling the global textile industry, UK cultivation of the ancient Andean superfood Quinoa, a new technique to identify heat loss from homes, Grow Heathrow, farmers markets, the potential for comedy and music to help deliver social change, and how transition offers the opportunity to reconfigure our sense of self (“the modern act of consumption has become inextricably tied to identity”). At £1, what incredible value for articles which educate, get you thinking about alternatives, and raise your spirits over the ingenuity of local communities to deliver incredible results.